In the year 2014, the lord smiled down upon (or up at) Kansas City, Missouri and bestowed to the municipality the first -- and last -- ever release from Blood Shaman. 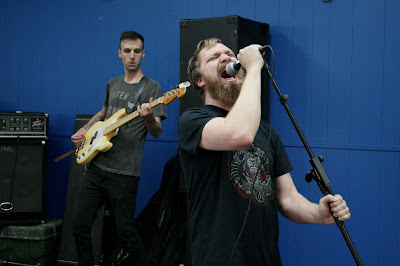 The band's abrupt end left many headbangers distraught and praying to whichever deities they found comfort in for a similar, but just as exceptional new band that featured vocalist Andrew Snow and bassist Max McBride. In 2015, those strangely specific prayers were answered with the formation of Inner Altar. Their first EP "Vol I" seems to have garnered more support online than it has locally. Hopefully with the release of "Vol II: Their Satanic Majesties Saturday Night Special" the band is given the chance to grace a larger local stage. Inner Altar creates the city's most dynamic and Satanic Medieval-themed stoner rock and doom metal. That combination of words doesn't sound very parent-pleasing, but if your folks rocked out to Sabbath back in the day, taking them to see Inner Altar and slam a few beers with you could easily be the best night out you have all month. Snow's lyrical content is often dark and mystical, his voice is maniacal, and the band can get heavy when they choose to, but these boys can crank out some of the warmest, fluttering rock melodies. Many bands in the genre shift between barely-audible picking and soul-crushing loudness, but Inner Altar opts to create songs with much more thoughtful structure. If you're interested in hearing a summary of the EP, look no further than the opening track, "Saturday Night Special." The song features unique tempo changes, winding riffs, Dillon Bendetti's lightning quick drum fills, and Snow's madman howls. Smoke cannabis, drink a cold brew, or simply light a stick of incense. Whatever your ritual is, it can only be improved tenfold when paired with Inner Altar's "Vol II." Stream and buy the release below. Cassettes copies will be available at the band's next gig.